With the growing number of states passing better laws governing the concealed carry of personal defense firearms, more and more people are exercising their God-given right to carry a handgun. Most would agree that if the need arises to defend oneself with a handgun, a large caliber in a full-size weapon is the best. However, for most of us, we must balance the need for power with the convenience of concealability, weight, and bulk. A large, powerful handgun that you leave in the pickup or car is of no use after you leave the vehicle. That is why most citizens with a concealed carry permit usually end up carrying a smaller, lighter handgun as a compromise. One of the most popular handguns to carry these days is the .38 caliber five shot revolver with a two-inch barrel, and for good reason. These little snub-nose revolvers are a great compromise of power, portability, and concealability. The most popular of these little thirty-eights are made of lightweight materials, which make them much more comfortable to carry in the pocket or purse on a daily basis. For some, however, the recoil of a .38 Special in a lightweight revolver is bothersome, and not conducive to good shooting. The recoil in some of the newest, lightest revolvers can be more than intimidating to all but the most seasoned shooter. 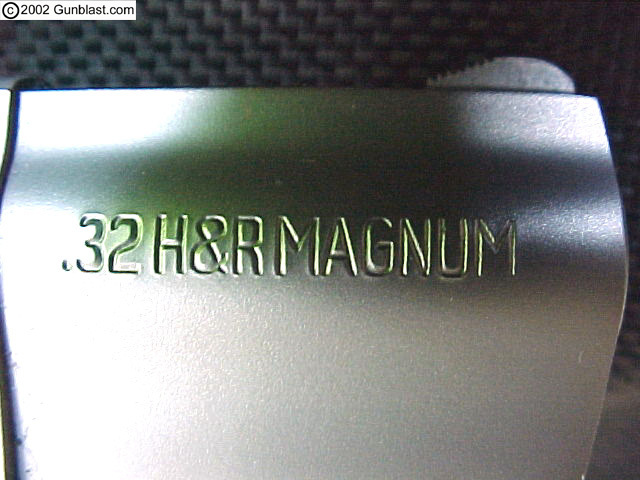 Thinking of the .38 Special as heavy recoiling is hard to understand for those of us who shoot heavy magnums on a daily basis, but recoil is always relative to the weight of the firearm, and perceived recoil can be fierce in a lightweight gun. To someone looking for a lightweight carry revolver with less recoil than the .38 Special but more power than the Rimfire twenty-twos, there is now a very good alternative: the .32 Magnum. Taurus has been manufacturing pocket size thirty-eights for many years, and has now introduced what may be the ideal platform for a pocket sized .32 Magnum. The Taurus .32 Magnum Ultra-Lite revolver has all of the features that make for a great little carry gun. 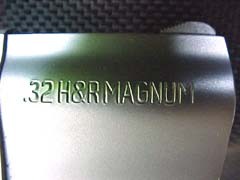 The .32 Magnum cartridge, properly loaded, offers good penetration and reasonable power in a compact, controllable package. 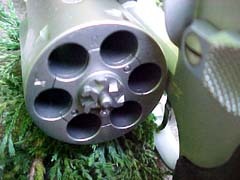 The Ultra-Lite weighs only seventeen ounces and has a two-inch, ported barrel. I recently received for testing one of these Taurus Ultra-Lite .32 Magnums, and continue to be pleasantly surprised by its performance. The overall quality of fit and finish is excellent. The Ultra-Lite is constructed of aluminum alloys and stainless steel, with a matte finish and a compact, yet hand-filling synthetic rubber grip. The grip is short in length to aid concealability, but offers good control of the little six-gun. Yes, it is a six-gun. The thirty-two Ultra-Lite carries one more round than most .38 Special small frame revolvers, resulting in a twenty percent advantage in available firepower. That could be important. One more round could make the difference in deciding the outcome of a confrontation, although I believe that the main advantage of the .32 Magnum over a thirty-eight is that of lesser recoil. The trigger pull on this little Taurus is very conducive to good combat accuracy. The double-action pull is smooth and registered just over ten pounds on the trigger scale, with the crisp single-action pull breaking at three and one-half pounds. 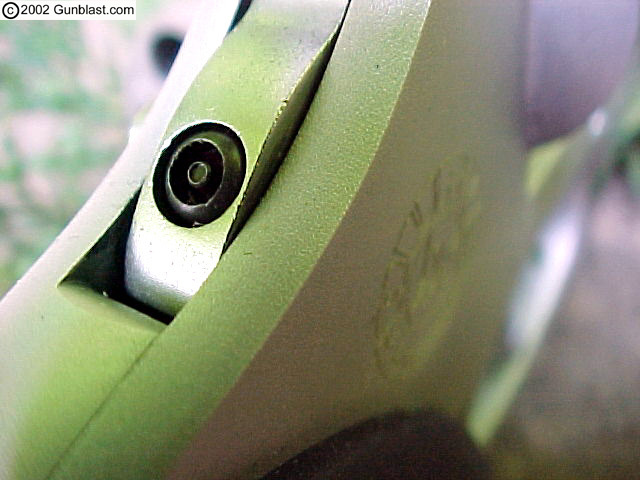 One of the most notable features on the .32 Ultra-Lite is the ported barrel. 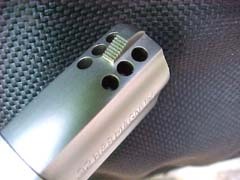 There are three ports on each side of the front sight. I was concerned that these ports would significantly reduce velocity in the short barrel, so I set up the PACT chronograph to see how the short ported barrel would negatively effect the power of the cartridge. The velocity readings were, surprisingly, comparable to those achieved from a four and five-eighths inch non-ported barrel, losing less than 80 feet-per-second with most loads tested. One of the better loads fired a 100 grain cast bullet at over 900 feet per second from the two-inch barrel. Perceived recoil from the Taurus was negligible, allowing rapid firing of the full six shots as fast as I could pull the trigger, and was definitely milder shooting than a comparable .38 Special. No misfires or malfunctions occurred at all with the Ultra-Lite. One surprise did occur, and that was the accuracy of the little six-gun. 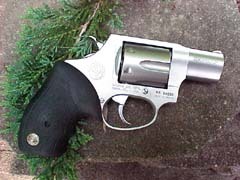 While the .32 Magnum is noted for displaying excellent accuracy, I was surprised at the ability of the short-barreled Taurus to shoot relatively small groups at twenty-five yards. 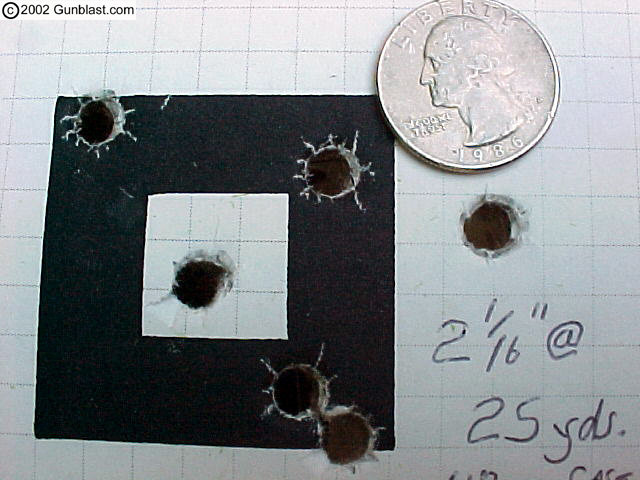 One six shot group went into a bit over two inches, with most loads grouping under three. For a small, light carry gun that provides a good balance of recoil and power, the Taurus Ultra-Lite .32 Magnum deserves consideration. 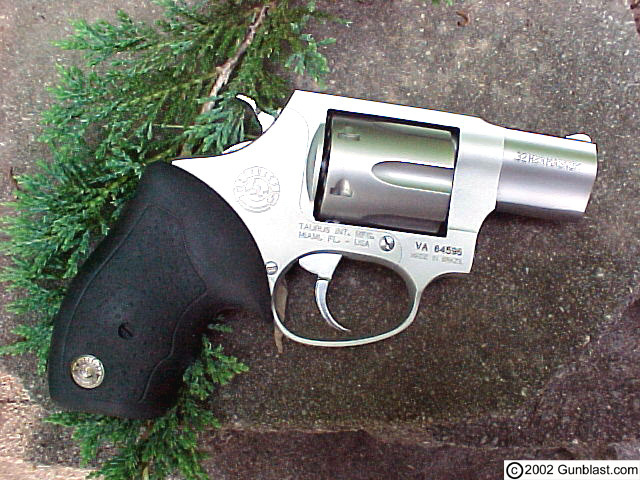 It is well-built, reliable, and has the Taurus hammer blocking Security System that is key-activated and unobtrusive. For a real-world compromise between power and ease of carry, the Taurus Ultra-Lite .32 Magnum is hard to beat! A handy little revolver, the Ultra-Lite .32 exhibits quality manufacture throughout. 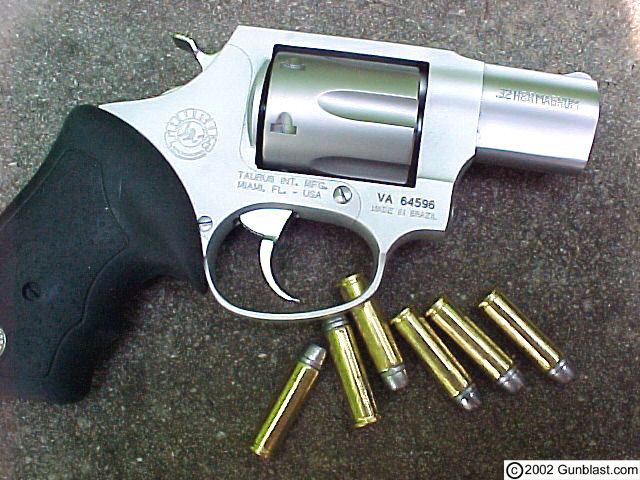 The .32 Magnum offers reasonable power in a very compact package, with more controllable recoil than the .38 Special. Another advantage of the Ultra-Lite .32 is the 20% firepower advantage of the six-shot .32 Magnum over the five-shot .38 Special. Recoil of the .32 Magnum is further managed by Taurus' barrel porting system, which is very effective in reducing perceived recoil. The Ultra-Lite .32 also features the patented Taurus Security System, which is a simple, effective and easy-to-use keyed locking device. 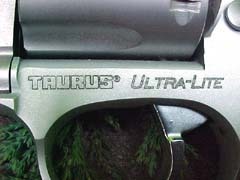 Author was surprised by the accuracy of the Taurus Ultra-Lite .32. Groups ranged between two and three inches at 25 yards with a wide variety of ammunition, which is excellent belly-gun accuracy. 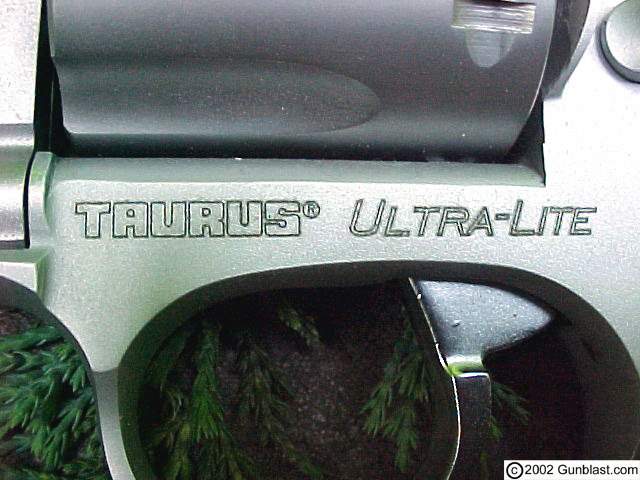 The Taurus Ultra-Lite .32 is a light, handy, accurate six-gun chambered in an excellent little cartridge, and represents an excellent value in today's market. When it is impractical to carry a heavier .44 or .45, the Taurus Ultra-Lite is a gun you can bet your life on!